Canggu is a popular town based on Bali’s west coast. It’s particularly popular amongst Australian and Kiwi tourists. The expat community is notable in the area with hip cafes, restaurants, beach clubs and so on. I have to admit there are other areas that feel a lot more like Bali, Canggu is somewhat westernised in my opinion. That said, it was absolutely fabulous for the kids because of the infrastructure of activities available for them. 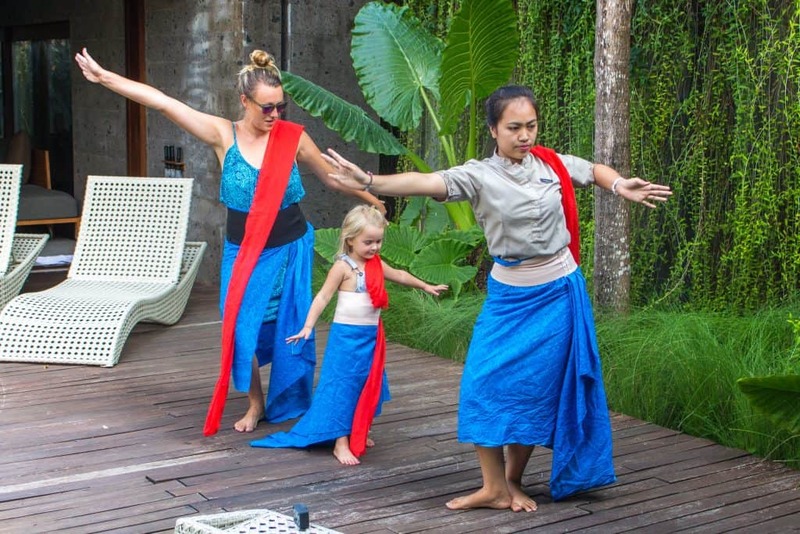 It’s easy to see why Canggu with kids is a drawing card for tourists and expats alike. Its one of the few towns that has rice fields as well as beach! I have no idea why I thought the rice fields were limited to Ubud, so, it was a welcomed surprise to be cycling past them in Canggu. 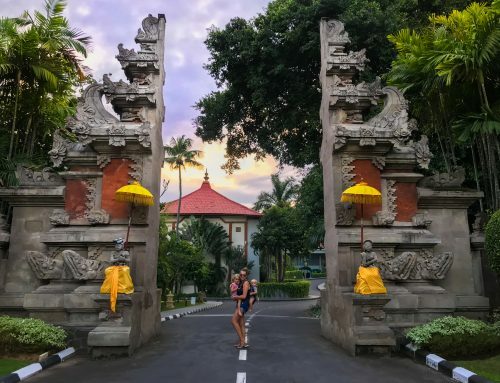 We have spent almost two months in Bali with kids checking out all of the areas. I have to say Canggu is a place I would love to come back to for the kids. It was perfect for them because it was easy to keep them entertained. In our usual format, here is our play, sleep and eat guide to Canggu with kids. Bounce Bali is a next level indoor trampoline park! it is so big and the great thing is, its suitable for all ages. From tots to teens, and parents to grandparents, everyone can try it out. It costs 100k per hour (around £5). It’s a perfect activity during rainy season, or if you are looking to escape the intense heat for an hour in the afternoon. The kids love getting upside down and jumping around. Not to mention it makes them nice and tired for bed time. After travelling for nearly a year now, our little toddler needs a break from us sometimes. She’s a social butterfly and one of the hardest things about this last year has not being able to give her the opportunity to socialise with other kids. I was so happy to find The Garden Bali. 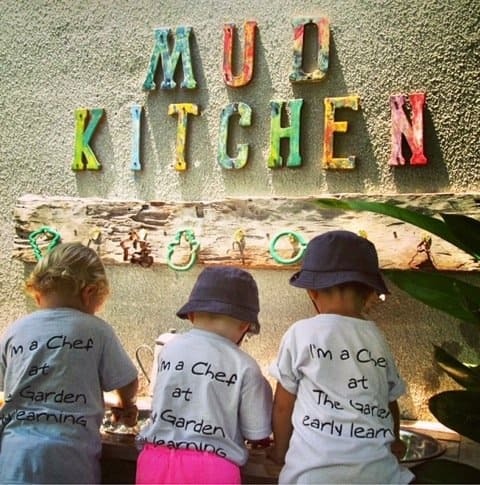 Its an early learning centre that has an hourly kids club for those over two years old. Younger children are welcome but a parent or babysitter needs to stay with them. They are open on the weekends as well which is an added bonus. They have a lovely indoor air-conditioned room with lots of nice toys, crafts and areas for the kids to relax. The garden was also a lovely space with tunnels, climbing and a slide. There is also some resident animals. I spotted some rabbits which our little one was raving about. I also loved the fact they have weekly baby sensory classes. They are at 845am twice a week. Sometimes everything can be about keeping the toddler happy, so, its nice to be able to something especially for baby. Finn’s is a famous spot in Canggu. Everyone knows where it is! Its right on the beachfront, next to the popular Berawa surf break. Featuring several pools and bars, its the perfect place to grab dinner and watch the sunset. Bounce Bali is part of Finns too. As is the water splash park and strike bowling. There is so much to choose from and it deserves at least one full day to explore. They offer special fun passes that gives one day access to all of the amenities for a really good price. Check this out if you are still looking for more things to do in Canggu! We stayed at The Santai which is about ten minutes drive out of town and part of Lifestyle Retreats. The hotel has several very beautiful private villas. We had a two bedroom pool villa. It was modern and chic to say the least. All of the interior was high-end and quite modern, not to mention incredibly comfortable. 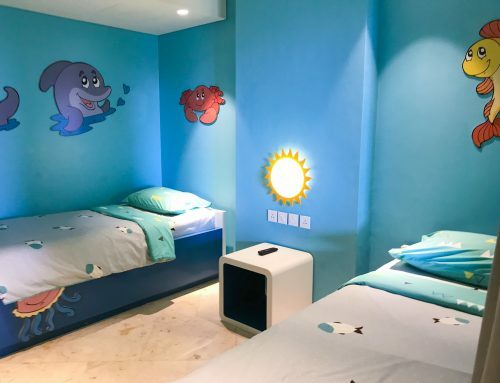 We spent three nights at The Santai and it was perfect with little ones. They had endless fun in the private pool. There was steps into it. The deepest part was 1.5metres. We loved the little lazy river through the garden. That was perfect for our baby to sit, splash, crawl and practice floating! He loved it. 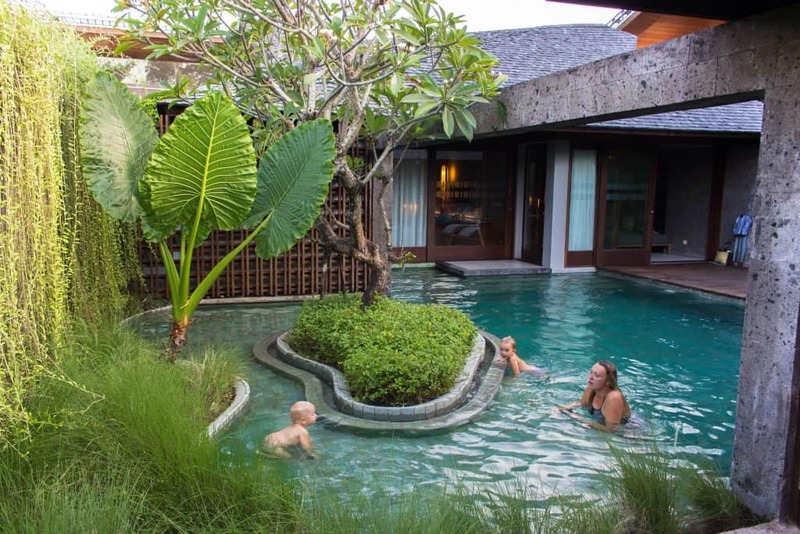 I know not all parents will feel comfortable with having an open pool at the heart of their villa. 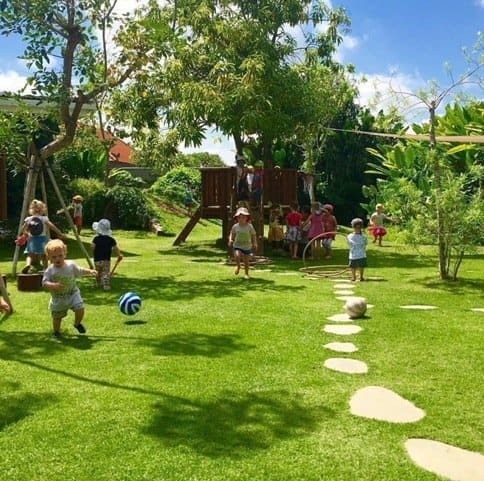 Bali Family Villas are a company that rent out pool fences as well as many other baby things, such as toys. They are really awesome and will deliver and pick up on the days you specify. 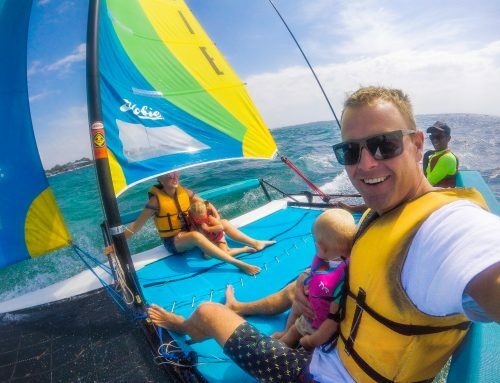 The Santai is great with families, We loved the complimentary activities for little guests. Esme had her face painted and she also had a Balinese dance lesson. Its super cool that staff come to the villa to facilitate everything. They also provide cooking classes for kids. We didn’t get a chance to try it but the pictures looked like it was fun. We had breakfast served to our villa every morning. It makes life so much easier than going to a restaurant with two little ones. 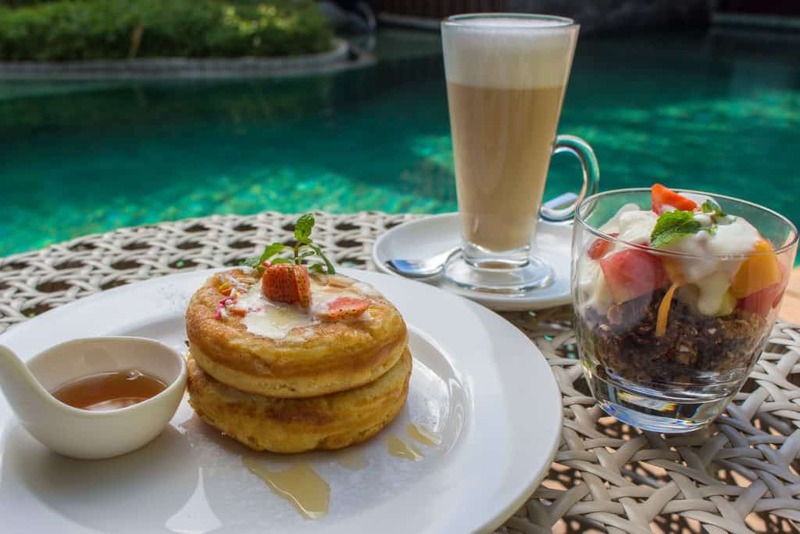 We had yummy pancakes, fresh fruits and granola as well as freshly pressed juices and good coffee. We didn’t eat out a lot whilst in Canggu. That said, we loved the restaurant next door to The Garden Bali. Sprout has a really lovely healthy menu. With lots of vegan and gluten free options too. I loved the fact they have a ‘little sprouts’ menu. Its not often you come across a restaurant that makes pureed baby food. I loved the salad options. There was so many to choose from that I couldn’t decide. When you can’t decide, no problem, they will make a trio of salads. They were so good and we loved the coffee too. As Esme was often next door in the kids club, I could sometimes park up and do some work or hang out for lunch and dinner with friends and family. Not that we were off-loading our toddler, she was always wanting to visit kids club! We re-visited multiple times. Some of the nice places that have really good healthy options are a little overpriced, but we found Sprout to be very reasonable. 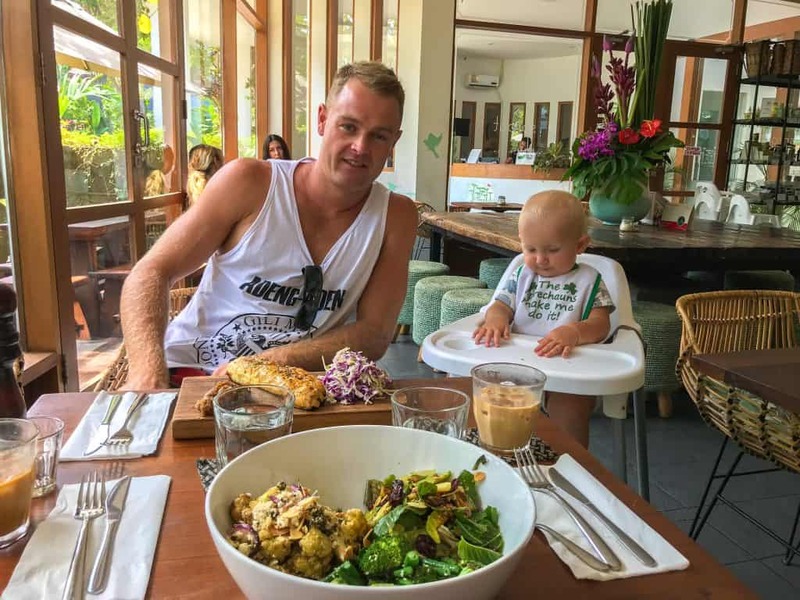 Have you found this Canggu with kids post helpful? Leave a comment, we would love to hear from you. If we’ve helped you in some way, we would love if you could help us too. In this digital age there is a demand for immediate information online. Being a patron is a new-age way of giving a small token of appreciation for this information, which takes time to put together, with no financial return. We offer exclusive access to blog posts before they are published as a thank you. We also offer travel advice and consultancy at different payment tiers. You can sign up to our Patron program here. 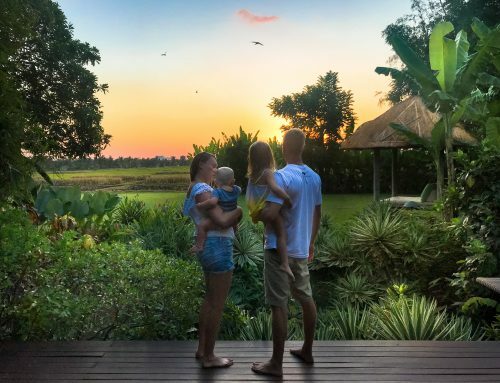 Disclaimer: This post Canggu with kids has affiliate links. Some of our stay was complimentary in return for an honest review. As always all views expressed are entirely my own.